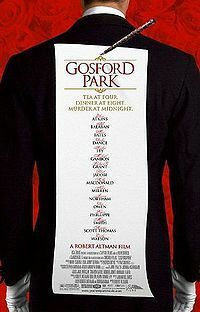 Gosford Park is a 2001 film directed by Robert Altman. The screenplay is by Julian Fellowes, based on an idea by Altman and producer Bob Balaban. It features an ensemble cast including Michael Gambon, Alan Bates, Derek Jacobi, Maggie Smith, Helen Mirren, Eileen Atkins, Kristin Scott Thomas, Jeremy Northam, Bob Balaban, Ryan Phillippe, Stephen Fry, Kelly Macdonald, James Wilby, Clive Owen, Emily Watson, Camilla Rutherford, Tom Hollander, and Richard E. Grant. The film is set in 1932 at an English country house. A party of wealthy Britons and Americans accompanied by their servants gather at the home of Sir William McCordle for a shooting weekend. A murder occurs in the middle of the night, the film presenting the murder from both the servants' and the guests' perspective. But rather than a simple mystery to be solved, the film uses the whodunit format to create a drama showcasing the tensions of the British class system. Many intertwining subplots detail the complex relationships among the characters, both above stairs (the wealthy guests) and below (the servants).